CELEBRATION, Fla. — B.A.S.S. LLC announced the 2012 schedule today for a three-division Bass Pro Shops Bassmaster Open circuit that will hit nine bass fisheries in nine different states. Timing on the fisheries was a top consideration in creation of the schedule — Lake Norman and Table Rock in April, and the James River in July, for example. So was geography: south to Florida, west into Texas, and north to Michigan. A fresh challenge was added with a Cayuga Lake tournament; that one is in August, perfect timing for upstate New York. The season will kick off with a Southern Open in central Florida, Jan. 19-21 on the Harris Chain of Lakes out of Tavares. Host to more than a dozen Bassmaster events since 1986, “the Chain” was the site of the 2011 Bassmaster Elite Series opener in March. Shaw Grigsby smoked the field with a sight-fishing bonanza of 75 pounds, 4 ounces over four days. The sprawling, canal-linked lakes have produced for Open pros, too. In a 2009 Open, Day 1 leader John Kremer posted 29-13, and eventual victor Bryan Hudgins on Day 2 sacked a bag that was 1 ounce shy of 31 pounds. Texas’ Lewisville Lake is No. 2 on the 2012 Open schedule. Lewisville was a “sleeper” stop in 2011, but pro Mark Tucker woke it up after a cold front with a catch of 45 pounds, 15 ounces over three days. The Feb. 9-11, 2012, tournament out of Lewisville, Texas, will be the first of three in the Central division. Lake Norman out of Charlotte, N.C., will keep Southern Open anglers going April 5-7. In the 2011 Open on Norman, a 25-year-old unknown from Ohio, Fletcher Shryock, put his name up on the bass board by posting 49-9 over three days in late March. The early April dates for the 2012 event could result in similar weights. Table Rock — a name that’s become bedrock in B.A.S.S. tournament history — will be the 2012 Central Open’s second stop on April 26-28. Like Norman and Lewisville, Table Rock is an encore from the 2011 schedule, but a 2011 Open champ from The Rock is still to come. Torrential rains in April forced a rescheduling of the 2011 Central event to Oct. 20-22. But come the 2012 Open dates in late April, there’s every chance that Table Rock will show its springtime potential for a big shallow bite and lots of limits. The tidal James River out of Richmond, Va., will be the site of the June 14-16 Northern Open, the division’s first of 2012. The James ran gold in the 2011 Open for Kelly Pratt of Williamsburg, Va., when he won with 42-6 taken on a shallow finesse bite. But B.A.S.S. and the James go back much further. After a 1983 James River Invitational won by the legendary Hank Parker, B.A.S.S. followed with three Bassmaster Classic river events in a row, 1988-1990. Rivers run through the 2012 schedule. Next up after the James will be Northern Open No. 2 on the Detroit River out of Detroit, Mich., July 19-21. The last time an Open was there, Todd Schmitz pulled off a come-from-way-way-behind win with 61 pounds. He keyed on the river’s deeper, cooler channel, a reliable midsummer tactic. But anglers can run to Lake St. Clair to find the cooler temps, just like the fish do. After Detroit, Northern Open anglers can shift their attention to Cayuga Lake and Seneca Falls, N.Y., for the Aug. 16-18 Northern season finale. Cayuga is a cool, deep fishery — max depth is more than 400 feet — but the northern-end shoals area is a known haunt of largemouth bass. Cayuga also has smallmouth bass — and Northern pike, landlocked salmon, lake trout, brown trout, rainbow trout, perch, panfish and other species. Finger-slim, the fishery stretches 28 miles and up to 3 1/2 miles wide. Not huge, but big enough. The Central Open finale takes place Sept. 6-8 on Fort Gibson Lake out of Wagoner, Okla. In 2010, Fort Gibson Lake was the site of a relocated Bassmaster Elite Series tournament. In the Elite Series tournament, pro Tommy Biffle of Wagoner capitalized on a home-lake advantage to haul in 73-11 over four mid-June days. With three days of competition, Open anglers aren’t likely to hit that mark, but a September time frame could help boost weights. Memorable for big spotted bass and several record spots, Alabama’s Lewis Smith Lake will be the last 2012 Open destination. Smith will long be etched in pro Andy Montgomery’s memory. 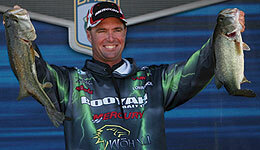 His win with 34 pounds, 9 ounces at the 2010 Open on Smith helped him qualify for the 2011 Bassmaster Elite Series. Hitting docks over deeper, stained water was a key to his success with spotted (and largemouth) bass in an unusually high-water situation for Smith. How the Oct. 4-6, 2012, event out of Jasper, Ala., goes for anglers should again be tied to water levels and clarity. Registration dates and details about the 2012 Bassmaster Open season will be announced soon. For more information about the Bass Pro Shops Bassmaster Opens, visit www.bassmaster.com/open. Jan. 19-21 Harris Chain of Lakes Tavares, Fla.
April 5-7 Lake Norman Charlotte, N.C.
Oct. 4-6 Lewis Smith Lake Jasper, Ala.
April 26-28 Table Rock Lake Branson, Mo. Sept. 6-8 Fort Gibson Lake Wagoner, Okla.
June 14-16 James River Richmond, Va.
July 19-21 Detroit River Detroit, Mich.
Aug. 16-18 Cayuga Lake Seneca Falls, N.Y.